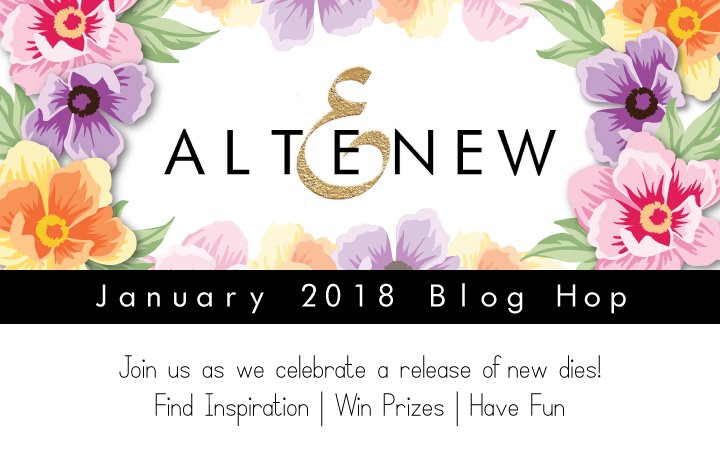 Hello and welcome to my part of the Altenew January Release Blog Hop! My mind, thoughts and heart are already in bright spring colors, so please don't undestand me wrong with these bold, even dark, colors in this release layout. I was so excited about the new Creative Edge: Lace Die I played with, that I couldn't do it any other way than black and white. The more contrast, the more visible the beauty of the lace. So I cut six simple frames and attached a piece of the lace to each and placed them in a circle design. To bring a little color, the photograph are unexpectantly color version and sure there's pieces of patterned papers here and there. Hope you find this inspiring! Here's the best part: Win $30 gift certificate to spend in Altenew store! The giveaway is super simple: just leave a comment here on my blog until Wednesday, the January 17th at 11:59pm EDT and I'll draw a random winner on 18th January - the winner is announced here in my blog then. Remember to come back and see if you won. So once you have left a comment here to me, hop on to Justine Hovey's blog to finish the Blog Hop. Hope you've enjoyed your time here, and we'll see soon again! What a fun, dynamic layout - beautifully done! Pretty layout... Love the colors you have chosen and using pictures awesome. Thank you for sharing. Oh yes! I totally agree that black and white was the only way to go! The lace DOES deserve to shine in all it’s glory! 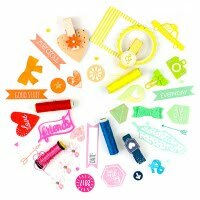 The pops of color from the enamel dots, string and photos are total perfection! TFS! I am enjoying all the inspiration on this hop. My favorite is the layered flower die. Thank you for the inspiration. always love seeing your wonderful layouts featuring your darling girls! Lovely layout - lovely release from Altenew! Terhi I love the idea of adding the lace along the bottom, brilliant. What a genius, superb & ultra fun layout this is! Cute layout. Thanks for sharing. great layout ideas, very nice. thanks for sharing. 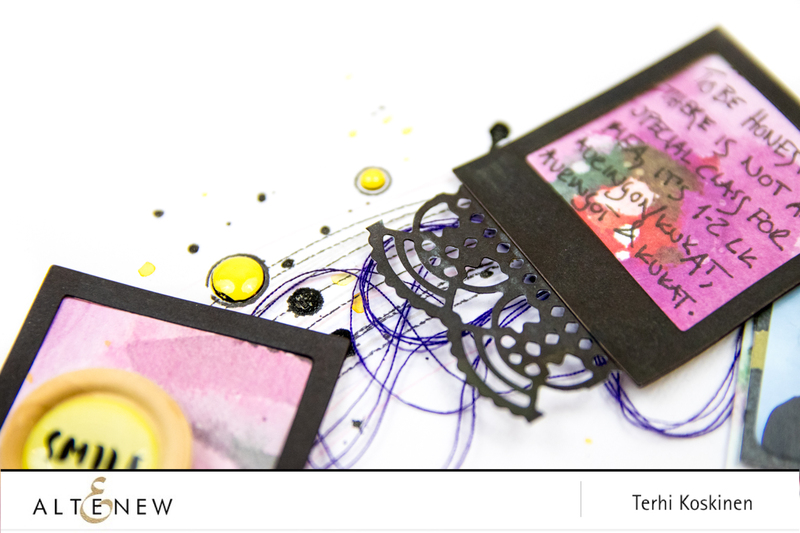 What a clever layout Terhi, I agree, without the contrast you loose the beauty of the diecut. A very cool layout, I like it! Well done. Great design with the frames. What an inspiring layout. Love it. Love your layout!! And loving that sweet lace die! I love the fun design on this layout!!! Such a fun release! What a wonderful layout! Using dark pieces of the lace border die under all the pictures really highlights and ties them together. What a gorgeous layout!! I love the design and they details!! What a striking layout! Thank you for sharing. Sweet layout - great release, thanks for sharing! Fabulous layout and use of he dies!! Very cute - Love that you cut the border die up to put on the bottom of the photos. What a fun layout!! I agree; that lacy die is just fabulous and it does look gorgeous in the black! Beautiful page, love this design with black and white, those lacy edge border pieces are awesome details. Really nice layout. Thanks for sharing your wonderful ideas..
Beautiful layout and I do like your choice of colors! Thank you for sharing! This is a beautiful layout. I love your fun design and use of color! Such a cute layout and lovely use of that edge die. Thank you for sharing. Terhi, I love how you used the lace die in your layout. It unifies the various pieces so well. Thanks for sharing it. Very cteatve layout. I love seeing other crafters work.thanks for the inspiration. Wonderful layout. I love all the details. Such a pretty project! Love that beautiful lace die... lovely details! Brilliant design, thanks for sharing and inspiring! Gorgeous layout!!! Love the new dies!! Love your idea with the lace die, pretty! Your layout is just right in black. Thank you for sharing. Such a different cool idea for a layout. Lovely. Really unique idea, wouldn't have thought of this myself but I think it's great using the darker colours makes it more dramatic. Such a fun and creative use of these elements in the release! Gorgeous layout! Wow! so beautifully crafted, Loved ti! Such a creative use of that die! Thanks for sharing! I started by reading the description that shows up first, then hit the "read more" and was startled to realize it was a scrapbook project (I was just assuming it would be a card!!) It is a wonderful layout and that die is probably the prettiest border I have ever seen. And it's wonderful not only as black on white, but complemented by your bright colors as well. Thank you so much. I'm always so interested in watching how to use knives and stamps from Altenew in working with layouts! Great layout! This is such a great release from Altenew again! Love all of it! Thanks for sharing! Love the layout and the way you used the dies. So pretty and fun! Very fun and creative layout! 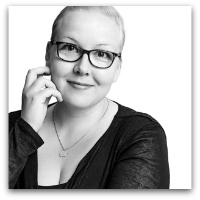 Nuo värit todellakin toimii!Wau mikä kombo! I am inspired to start scrapbooking again. What a unique and pretty layout! Thanks for sharing this sweet page design! I love how you arranged the pictures. Love the lace border behind the pictures too. What a fun layout! Love the design! Love how you only used "SNIPPETS" of the border die in your layout! Lovely layout! Whimsical and elegant - so fun! What a fun and cute layout! Wonderful layout! Love the beautiful colors and creative designs! Your layout is so fun and beautiful ! I loved your wreath layout . Thanks for sharing. I agree about the bold colors. They let each individual element of your layout shine without being overwhelming. Nice job! Nice layout. Nice use of the lace die. I love your layout. Very inspiring and original the use of the lace die. Love how you used that border die! Adorable use of these dies!! What a fabulous way to use these dies!! AMAZING page! Lovely layout idea - very creative use of the dies in this Release! Love the circle of photos! And great use of the Lacey die! Love Love Love this layout! The pictures are arranged in such a fun way and I love your darker colors! Such a wonderful idea, Terhi! Love the lace wreath & your awesome page! Love the dark colours on this layout, and the circular pattern. Thanks for the inspiration. Such wonderful inspiration. This release is just amazing! Love how versatile is product is. Thank you for showing it in a unique layout. Love how you created the frames with the lace die beautiful job! A beautiful layout - full of unexpected surprises! 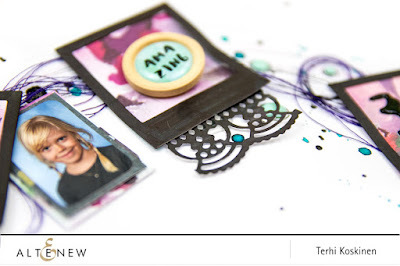 I love how you used the peaks of the lace die and how you incorporated so many photos. It all comes together wonderfully as lovely wreath on your page. Genius! Thanks for participating in the blog hop - I love seeing how creative the designers choose to use the Altenew products! Great inspiration! That is just such a fun layout! Such creative layout and uses for the dies! What an amazing layout--it shows the dies versatility! Thanks for sharing your creativity! Wow, what a unique layout! I love the dark colors! What a cool project, love it! Fabulous LO Terhi! Thank you for the inspiration! Wow! What a fun and colorful layout. Love it! 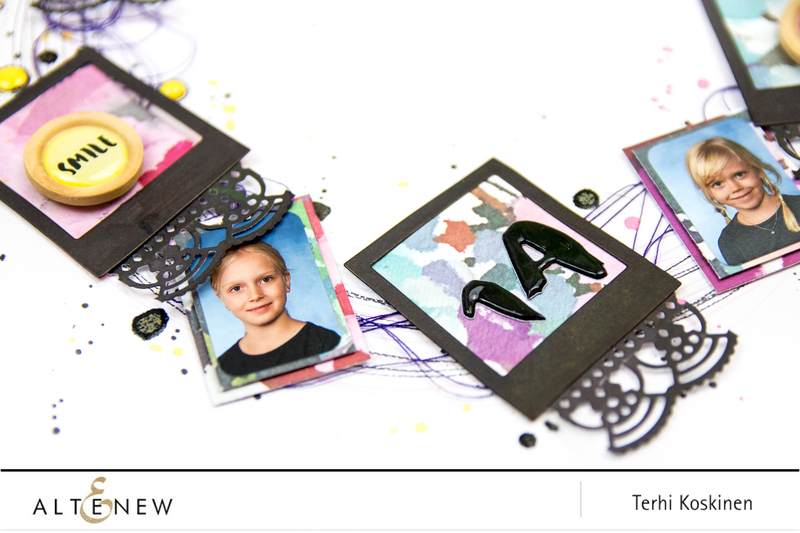 Lovely scrapbook layout & a great way to keep those school pictures. Great scrapbook page. I've already fallen in love with the lace die cut -- and I really like how you added pieces to each picture -- like a tassel. I love the wreath you made, very original. It would be a great way to display your kids school pictures. This is such a fantastic release! Nice layout. Such a nice layout! Super creative how you used that lace die! I want to see my fans.